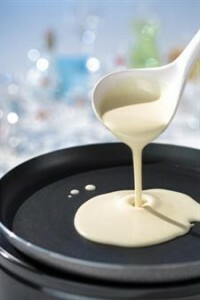 If it is soggy, heavy or tough, then you made have made the batter too thick or overfilled the tin. In order for batter puddings to rise and be light and airy, they need a hot oven and hot fat so problems such as the above may also be as a result of the oven or fat being too cool. If your batter pudding hasn’t risen properly, it could be because your batter is too thin, or because the oven temperature or fat temperature was too cool. If your fritters are greasy, it may be because the fat is too cold or because they haven’t been drained well enough. It the food inside the batter is undercooked, it is most likely that the fat is too hot and is cooking the outside of the food too quickly. Alternatively, the food pieces inside the batter might be too big. Occasionally the batter might float off the food. This could be because the food wasn’t dried off properly before being coated or because the batter was too thin.